Garden Bouquet with Gazebo tapestry shows an overflowing bouquet in the gardens of Versailles. Based on the original from the botanical painter Redoute, this piece shows his mastery of color and light, with a scene from the Trianon's gardens in Versailles. Marie-Antoinette, the last queen of France, so loved and admired his work that she made him her professor and official court artist. This study of landscape and floral still life is typical of Redoute's works which reflected his love of flowers, as he was a botanist in addition to being an artist. 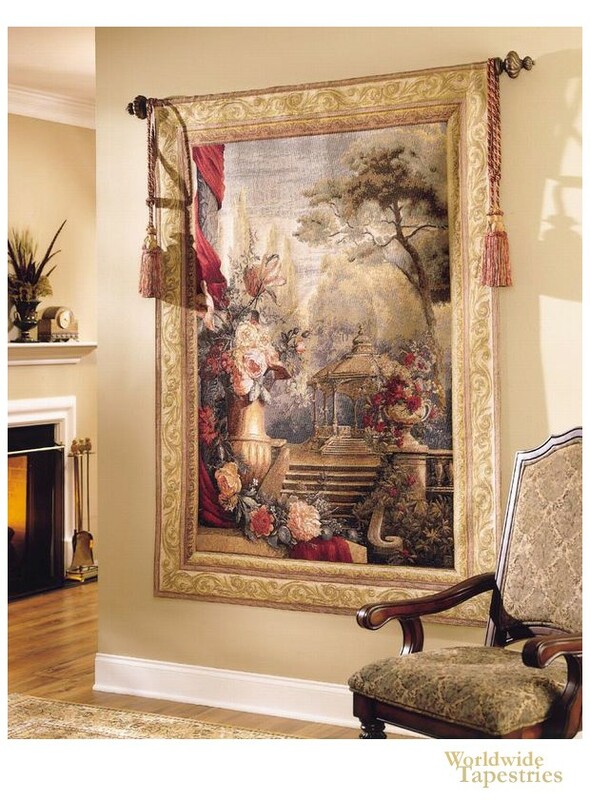 This French landscape tapestry "Garden Bouquet with Gazebo" comes complete with a tunnel for easy hanging. Note: Tapestry rod and tassels, where pictured, are not included in the price.